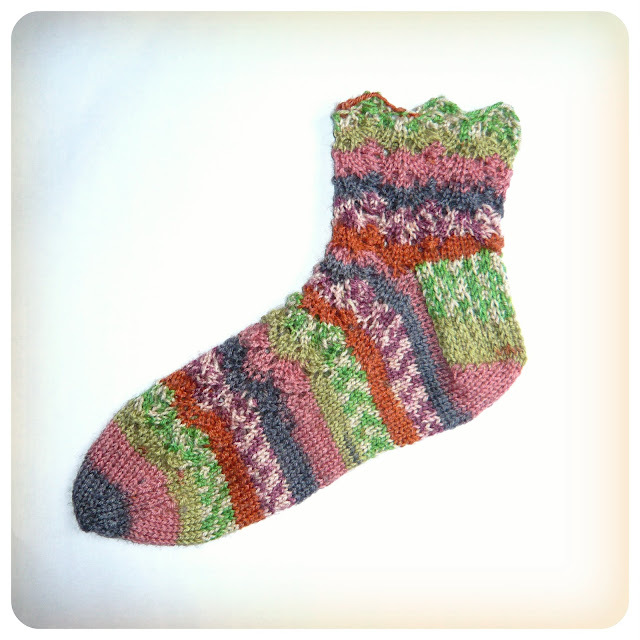 As you may already know, I have recently discovered the joy of knitting socks :-) I am so addicted to sock knitting now that I lay awake at night thinking about all the socks I could knit and different variations I could try and all the gorgeous sock yarn I "need". I really need to get some good sock blockers so I can show you the socks at their best. It's a little difficult to really see the detail of the lace in the Alegria Sock in the photograph. The yarn I have used for this particular pair is Rico Design Superba Bamboo and it is SO lovely to work with and wear! It's super soft and smooth, easy to knit, good stitch definition, pretty colours... all the qualities you want in a yarn :-) Also, just in case you're curious, this sock weighs 19g, the yarn comes in a 100g skein so I should be able to get 2 pairs from one skein! Yay! The pattern is now in the testing stages and will be available on Ravelry soon! P.S. These socks work well with my other addiction...clogs! Yummy socks. Always delightful to meet a sistah clog-lover! So glad you're joining us for Blogtoberfest12.